Bulova has represented innovation and precision in the watchmaking industry for decades. The Accutron plays an integral part in the history of technology. It was succeeded by the Precisionist timepiece. Bulova offers a wide range of watches, but the overarching theme of their timepieces is precision. For decades, this American manufacturer has prided themselves on impressively precise watches. Their most famous watch is without a doubt the Accutron, a predecessor to the quartz watch, which experienced the height of its popularity in the 1960s. Today, Bulova offers the Accutron II. It has a retro design inspired by the original model, but is powered by modern technology. You can recognize an Accutron II by its crown, which is unusually placed at four o'clock. Bulova is setting new standards in terms of precision with their Precisionist collection. It only deviates 10 seconds a year, which is amazing for a quartz watch, as these watches are not synchronized to a time signal. The Precisionist has a very technically-oriented look. However, Bulova also produces watches with designs that are front and center. One series is dedicated to the architect Frank Lloyd Wright (1867 - 1959); the watches in it are inspired by Wright's work. The Diamond series is comprised of diamond-set women's watches. The watches made in collaboration with Harley Davidson have a completely different look. The logo of the motorcycle company is printed on the dial of this rustic collection comprised of over 40 models. The short end of the seconds hand on these models ends in a small H and D.
Another highlight in Bulova's offerings is the Moon Watch. It honors the use of Bulova watches during Moon missions. Its design resembles the original model that was part of the Apollo 15 mission and spent some time on the Moon. The Marine Star is the Bulova of choice for water sport fans. It's waterproof to 100 m (10 bar). The bezel is secured to the case via six visible inbus screws, creating the porthole design that was first popularized by Audemars Piguet's Royal Oak and is often used by Hublot. The Curv catches your attention with its peculiar shape. Its 43-mm or 44-mm case fits seamlessly on the curve of your wrist and its movement was also appropriately modified. According to the manufacturer, the timepiece is the first chronograph with a curved movement. The subdials on the sporty Curv are arranged in a Tricompax layout. Bulova primarily uses quartz watches in their collections, although some watches feature a mechanical caliber. Watches with a skeletonized dial, which give you a view of the movement, are a part of their classic automatic series. Which Bulova should I buy? The vintage market plays a large role when buying a Bulova. An Accutron from the 1960s is considered to be one of the most unusual watches in the world. Technology enthusiasts, as well as watch lovers, flock to these watches. A real Accutron from this time period in very good condition costs around 1,600 euros. The modern retro variant Accutron II is significantly more affordable at only 250 euros. 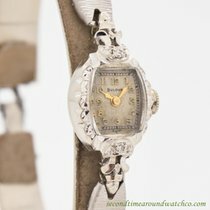 There's a large selection of Bulova watches available from different centuries. Their condition and materials will greatly influence the price. A chronograph with an 18-karat yellow gold case and automatic movement only costs 1,300 euros. Fans of vintage diving watches will also get their money's worth. If you prefer a watch with the most modern quartz technology, then the Precisionist line is a good choice. The chronographs in this series have a diameter of 48.3 mm and a thickness of 17 mm; with those dimensions, they make good companions for larger wrists. They're also waterproof to 300 m (30 bar) , making them perfect diving watches. New chronographs cost around 900 euros. However, simple three-hand watches with a diameter of 43 mm are also part of the Precisionist collection. 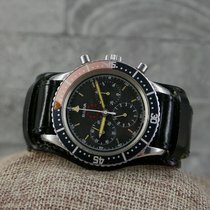 These timepieces are waterproof as well, but only to 100 m (10 bar). The Moon Watch is equipped with the same high frequency quartz technology as the Precisionist, but its design resembles watches used by astronauts in the 1970s. Its stopwatch function allows you to time 1/10ths of a second. The Special Edition Moon Watch Chronograph has a diameter of 42 mm and its case is waterproof to 50 m (5 bar). You should prepare to spend around 500 euros on this timepiece. The Accutron had considerable influence on the history of watch technology. The timepiece is also known as a tuning fork watch and paved the way for the modern quartz watch. When the Accutron was introduced to the market in 1960, it was a sensation. Instead of a balance wheel, it used an electric-powered tuning fork. While most mechanical watches beat at a frequency of 3 or 4 Hz, the Accutron beat at 360 Hz. The timepiece shares important features of the quartz wristwatch that was to come: both systems use a battery as an energy source and vibrate at a much higher speed than a regular timepiece. This results in incredibly precise timepieces; levels of such precision were unheard of before the Accutron made its premiere. The higher frequency results in a deviation of only one minute a month. The model series declined in popularity in the 1970s as cheap quartz watches from the East with a frequency of 32,768 Hz became more mainstream. Bulova has set the bar even higher and refined their quartz technology since then. In 2010, they presented their Precisionist series at the world's most important watch trade show, Baselworld. It oscillated at a frequency of 262,144 Hz, eight times faster than typical quartz watches. The deviation of 10 seconds a year can only be beat by radio and GPS watches. Over the years, Bulova has added 262 kHz technology to many of their series. One mark of this technology is a smooth-sweep seconds; quartz watches usually feature jumping seconds, which move in one-second increments. Bulova has a long history behind it. Joseph Bulova (1851 - 1936) founded the company in 1875 in New York, where the headquarters are still located. Since 2008, Bulova has belonged to the Japanese Citizen Group. 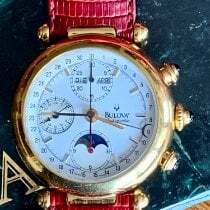 In 2017, the Bulova chronograph worn by astronaut David Scott when he walked on the Moon in 1971 was sold for a record $1.6 million. There is still moon dust on the Velcro fastener.